Brian Martinez, Assistant Superintendent of the Grass Valley School District, stands in the multi-purpose room at Lyman Gilmore Middle School. 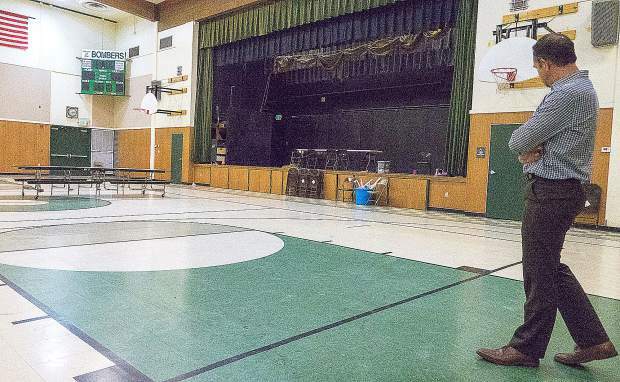 The floor needs to be replaced, one of the improvements that would be funded by Measure D.
The last time the Grass Valley School District pursued a general obligation bond in order to improve its schools was 1967. However the state of disrepair of some of the district’s five schools has prompted the board to ask Grass Valley voters to approve a measure that would grant the district $18.8 million in funds. General obligation bonds have funded large portions of school construction projects throughout the state, and often help communities qualify for matching funds. The source of repayment for these types of bonds is a tax on all taxable property — residential, commercial, agricultural, and industrial — within the Grass Valley school district. The projected annual tax rate would be $24 per $100,000 of taxable property value. Much like an individual’s mortgage, Measure D bonds would be paid back over the span of about 30 years. If passed, the measure could help fix restrooms and replace outdated buildings and classrooms, including gas lines and plumbing. Supporters of the measure say that it would help provide a clean, safe, quality learning environment for current and future students. The funds would be used for a number of projects including the repair of leaky roofs. Grass Valley assistant superintendent Brian Martinez said the leaky roofs have been a major problem and, on rainy days, create additional work for maintenance supervisors and technicians. Martinez said that although you can’t see them, underground utilities are in a similar state of disrepair. The bond, he said, would allow the district to take preventative measures instead of waiting to see if and when they will fail. “It’s something not quite as visible but a responsible school district should be taking care of,” Martinez said. Classrooms are in need of updating, everything from cabinetry to furniture. Martinez said part of keeping families in the school district is offering nice, clean classrooms. He said the first impression a school makes on parents and children is key in keeping them enrolled in the district. Voters may feel a sense of familiarity as Measure B was approved fairly recently in 2016. However, the funds raised from that measure can only be used to improve high school facilities. All registered voters who live within the Grass Valley school district will have the opportunity to vote on Measure D.
The measure has met with numerous obstacles in regards to providing voters with accurate and required information, according to the district. The first challenge came when it was discovered that the measure was erroneously omitted from about 7,000 voter guides. The approximately 9,000 guides that did include the measure left out four of the five signers for the argument. None of the guides included the required project list information, a longer document that presents the full text of the bond measure including background information, accountability requirements and all restrictions. 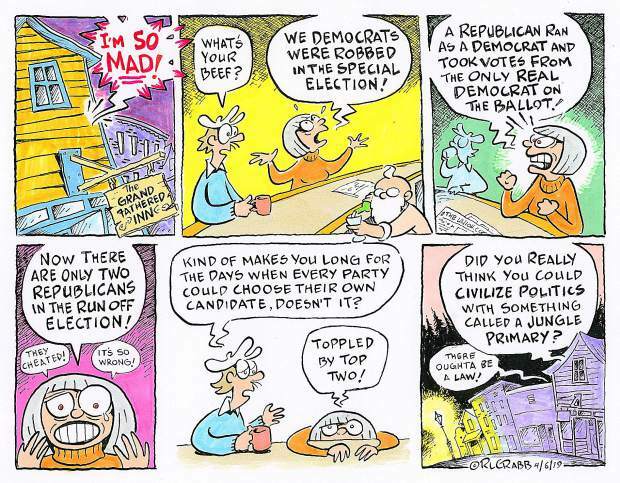 The omissions are on voter information guides only. They do not affect sample or official ballots for the two measures, officials said. In an effort to remedy the situation, the Nevada County elections office mailed out not one but three supplementals to voters within the Grass Valley school district. Despite the errors Martinez said he remains hopeful that Measure D will pass, and he noted that the measure has no formal or organized opposition of which he’s aware.